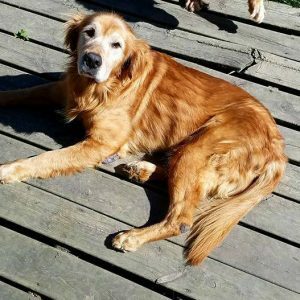 Hi, I’m Trapper and I am enjoying the golden life at my foster home. I have severe arthritis and mobility issues, so the goal is to keep me comfortable. Take a look at my picture, I would say I am quite comfortable! I love lounging on the deck or the yard and will roll on my back for a good game of bitey face with my foster siblings. Since I really have trouble moving around, As Good as Gold said I can stay as part of their family. Isn’t that awesome? They are making sure I am enjoying all that the golden life has to offer me. My age is a guess since I was a stray, but I am definitely in my golden years. If you would like to help me or other dogs like me, please click HERE and tell them I sent you. We will all be grateful! !